IT monitoring and metrics play a key role in measuring IT service management success. By properly analyzing, understanding and measuring where the true value lies in your organization, you can effectively analyze risk, add value, reduce the cost of service delivery and boost the overall performance of your service teams. But without knowing what to measure, how to interpret the results and how to leverage your organization’s tools and data to make this possible, you’re setting yourself up for frustration and a lack of clarity in your reporting output. On Thursday, May 17th, join BrightTALK and Vivantio’s Senior Implementation Manager Quentin McPhee to learn what you and your senior management need to inform IT decision-making and drive sustainable service improvement, in practical terms. Quentin McPhee has more than 20 years’ experience in service management delivery and brings significant knowledge in implementing solutions for all types of organizations. We’ll also cover real-life examples of organizations who have improved efficiency through effective data analysis. Vivantio is a leader in help desk, IT service management and customer service software, empowering service teams to embrace automation and improve service levels at hundreds of organisations around the world. Are you sensing that your service desk might be in trouble? There are many threatening issues out there that can wipe out your team if you aren’t careful. But, there are also many evolving ITSM strategies you can incorporate into your service arsenal to become a real hero for your team. In addition to co-authoring the ITIL® V3’s Continual Service Improvement core volume, George Spalding was honored with the 2012 Ron Muns Lifetime Achievement Award from HDI and is one of the world’s most insightful and engaging IT Service Management and Support experts. In addition to his extensive commitment to moving the industry forward, George spent several years as a consultant to the White House on technical presentations and White House conferences. He also coordinated technical presentations for members of the President's cabinet, the Smithsonian Institute, and the Federal Bureau of Investigation. George is an ITIL Expert, the highest level in the ITIL certification program, is a regular author of IT articles and white papers, and a frequent presenter at global IT conferences and events. 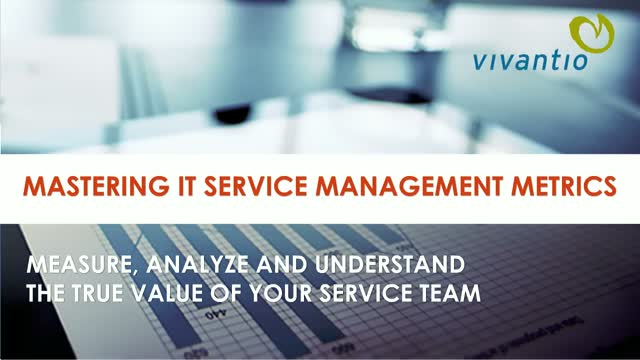 Join Vivantio and David Wright, Service Desk Institute’s Chief Innovation Officer, as we explore why staying on the cutting edge of service is a huge priority for many CIOs and IT Managers. Learn about innovations you can bring to the table at your next leadership meeting and how you can get the rest of the organization behind your methods to bolster service delivery. Vivantio’s philosophy is simple: Cover your core ITIL principles, then go beyond to provide the best possible customer experience. The Vivantio Platform allows you to focus on the tools that make sense for your unique organization’s service model: from incident, problem and change requests to service requests and client, knowledge and asset management. Mix and match the features of the Vivantio Platform to build your organization’s ideal service environment.